It's not necessarily a new idea. 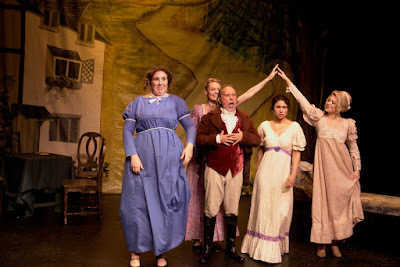 In fact the musicalization of the Jane Austen classic “Pride and Prejudice” has seen recent stage life in an entirely different production at NYMF in 2011 and at La Mirada Theatre a few months back, though the conceit is a bit more unique. There were truer book adaptations done in London and Chicago, both of which are penned by different writers. The appeal of giving the epic romance the musical treatment is apparent. It’s rich with character and love and everything a musical ideally needs. Playing at Theater for the New City, John Taylor Thomas' Pride and Prejudice is a long musical version that has great difficulty finding its groove and resolve. "Pride and Prejudice" is a beloved story, receiving film and stage treatments for generations. Though the story is virtually the same, Thomas’ Pride and Prejudice follows Austen’s novel about the unwed Bennet sisters and their pursuit for love. Thomas includes nearly every major and minor character of Austen’s story for his stage production, something that seems to be one of the very many downfalls of this show. The score, for the most part, remains pretty consistent and alike stylistically. Thomas gives practically every character their own number, many of which do not further the story at all. These fluff songs could easily be eliminated to cut much needed and valuable time. The sound Thomas uses is reminiscent of the Golden Age of Broadway mixed with a tinge of Gilbert and Sullivan. The only song that seems out of place is Jane’s Act II number as it had a bit more of a modern vibe comparatively. While music is the draw of a musical, nothing can kill a show more than a vapid or over-stuffed book. The draw of "Pride and Prejudice" is the will they-won't they romance between Elizabeth Bennet and Mr. Darcy. And when adapting it for the stage, this needs to be the dramaturgical focus. As far as subplots and minor characters are concerned, if they don't directly have anything to do with forwarding Lizzie and Darcy's story, they're not necessary on stage. Thomas’ musical adaptation spends too much time with the less important plots that it's no wonder the production surpasses a long third hour. Not every single moment from the book needs to be recreated on stage. Taking liberties is not necessarily a bad thing. With bad material, finding standout performances from the acting company was like finding a diamond in the rough. Thankfully, there were a few. Rebecca Knowles and Hallie Wage as Lydia and Kitty Bennet respectfully brought the full package. As the giddy bouncy sisters, Knowels and Wage made their characters real and invigorating, something the rest of the drab ensemble could not do. There were some wonderful vocals from Britney Simone as Mary, Stephanie Leone as Jane, and Chris Donovan as Mr. Bingley. Casting a pair of impeccable leads as Elizabeth and Darcy is crucial. If you don’t care for them, the piece is over. Sadly, neither Amanda Yachechak or Jonathan Fox Powers could deliver worthy performances. Yachechak did not have the fervor for the mighty sister. Powers, like many of the men of the show, was charming-lite. Their lack of chemistry was solidified at the end of the show with their long, awkward kiss. The great trouble with Pride and Prejudice from a production standpoint is it doesn't quite exit the vibe of "community theater." Transitions are messy. The scenic elements don't match. The acting is all over the map. But with a keen eye, these mishaps could easily be avoided. Director Lissa Moira struggled to find the proper theatrical vocabulary to make this a successful production. As far as staging, Moira struggles with consistency. With no scenic architecture to create the Bennet household, among other locales, Moira has her ensemble use the only two entrances behind the scrim to come and go. Yet it's a free for all where those paths lead as the presumable front door switches from scene to scene, actor to actor. Moira doesn’t assist her company in discovering ways to find expression in the one-dimensional characters. Many of Moira’s directorial choices are border-line bizarre. Musical theater is known for the musical freeze device where a character sings and the ensemble is virtually frozen behind. While lighting usually assists in melting the world away, when that is not possible, any movement is distracting. One of the prime moments of this was during Darcy’s song where he sings of Elizabeth dancing. Had Moria allowed Darcy to see Elizabeth partake in the action he’s singing about, it could be possibly be excused. Not only is she not dancing, Moria has Elizabeth talking to another character while the rest of the ensemble is frozen. Another great example of the absurd is the final stage picture. It includes the ensemble on stage for the joint wedding. Moira not only has Lydia and Mr. Whickham on opposite sides of the stage, but he is linked arm and arm with Mary Bennett! Other strange choices included the poor casting decision of Henrietta Steventon as Mrs. Bennet, who not only looks younger than some of her onstage daughters but also offers an over-the-top caricature display that could only be compared to a cartoon. Moira employs a series of scene location through improper voiceover that garnered some laughs simply due to its jolt of intensity. Prop, set, and costume coordinator Lytza Colon compiled a jumbled muster of furniture that was recycled into ever scene. Mr. Bennet's modest income or not, the lack of matching chairs in the Bennet house was upsetting. But nothing was more disappointing than the backdrop that looked sloppy, especially due to the random fake greens and winding road that lead to a grey city of the future. The choreography by Robert Gonzales Jr. was primarily featured in the ball scenes. Gonzales Jr. seemed to be clueless how to use the stage properly, cramming the ensemble into a line where the actors couldn’t navigate or maneuver their way around the person nearest them. The balls needed to be grand. They were anything but. When “Pride and Prejudice” plays closer to a Gilbert and Sullivan comedy than an epic romance, something is wrong. This production of Pride and Prejudice needs assistance in the slicing and dicing of fluff material in order to something of note. But with stiff competition, it may already be a losing battle.